This beautiful otter collage was created by Poppy Lewis-Ing who is the otter ambassador for the Ullapool Sea Savers. Ullapool Sea Savers are a group of children who protect the marine environment around where they live. The Ullapool Sea Savers played a major role in preventing the mechanical kelp dredging that has been proposed in the seas around the west coast of Scotland. 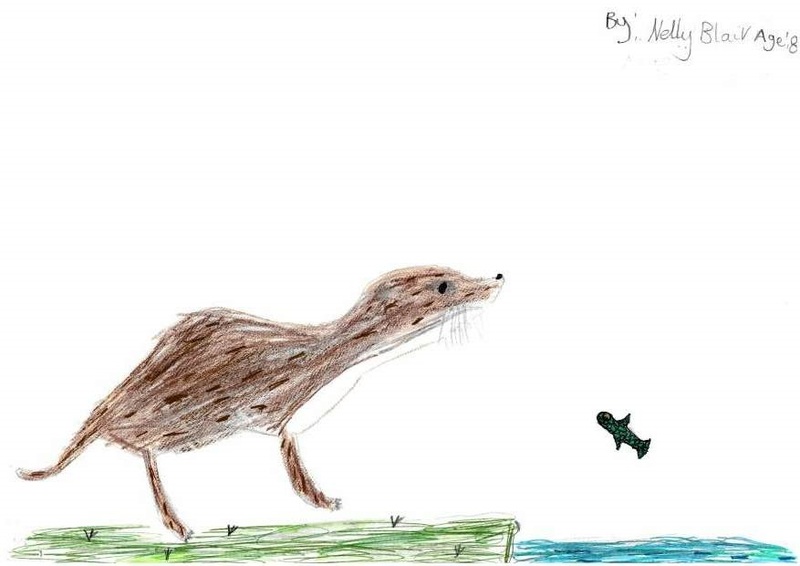 Should this proposal have been granted it would have had major implications on the habitats for all coastal species, including otters. 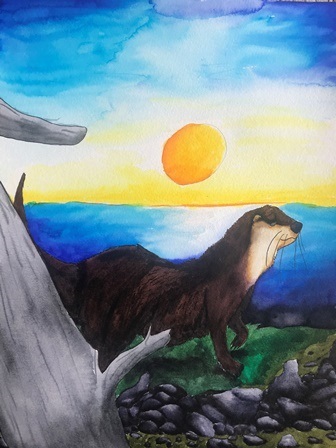 Here is IOSF's artwork competition winner for 2018. 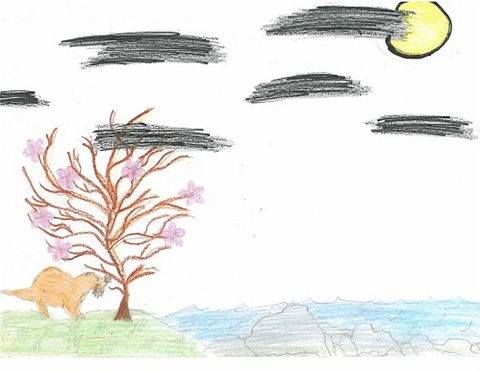 The winner, by Molly Simko, aged 11, from Pennsylvania, USA beat a lot of really good competition to this year's prize. We were ready to go. Dad started our brand new 4x4 pick-up engine. I waved to mum as we drove off. First we turned off the main road, down a muddy, wet, bumpy trail. It was so much fun. We went up a nearly vertical hill. Suddenly, Dad slammed on the brakes, screech! 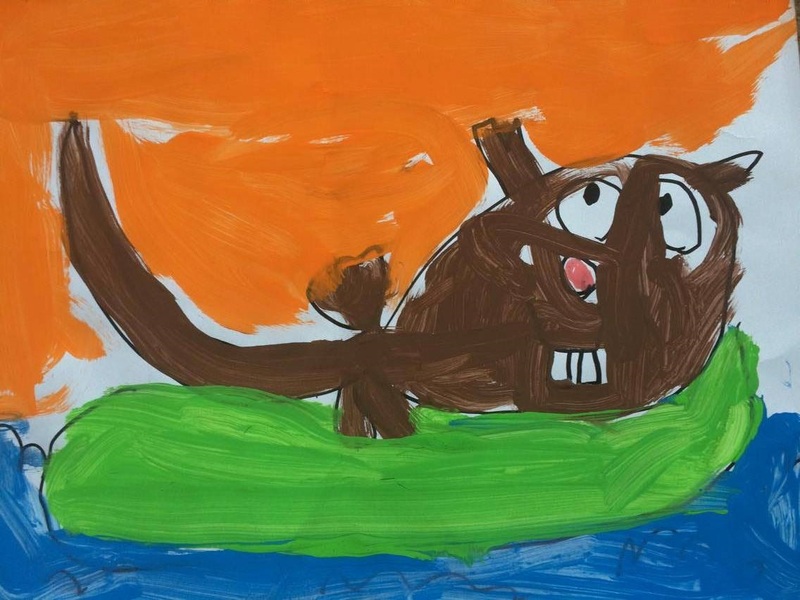 We saw something brown and furry peeping out of the grass. I jumped down out of the pick-up truck and walked slowly over. I saw an.....OTTER! I was really excited as I had never seen an otter in the wild before. 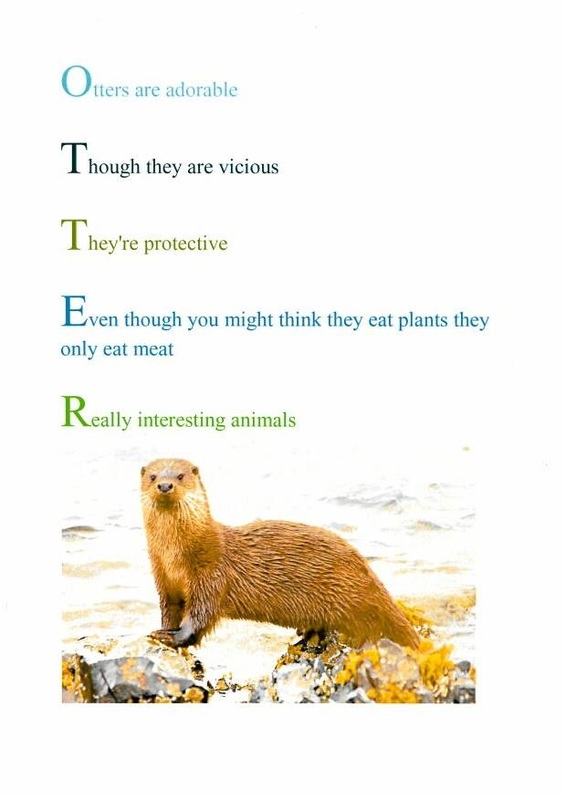 As I got closer, I noticed that the otter had a sore leg. I beckoned to dad to come and have a look. He GASPED! 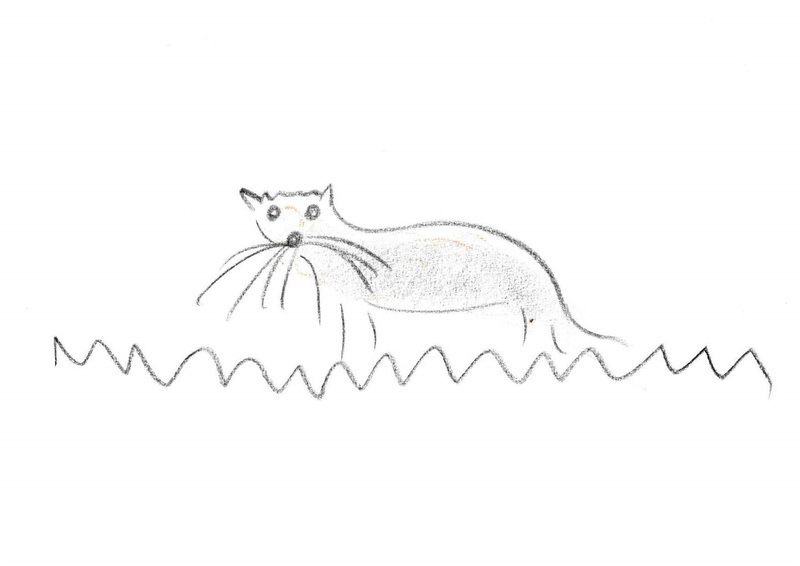 It had a fishing net wrapped around his paw. I looked at dad and wondered what we should do. 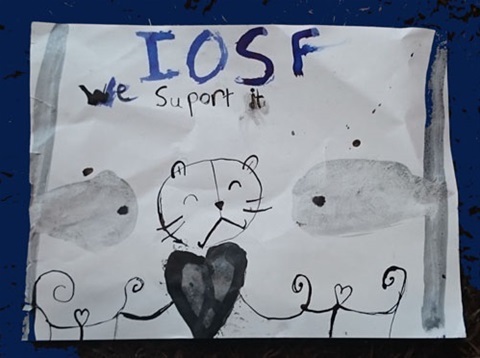 Then I remembered about the International Otter Survival Fund (IOSF) hospital in Broadford. 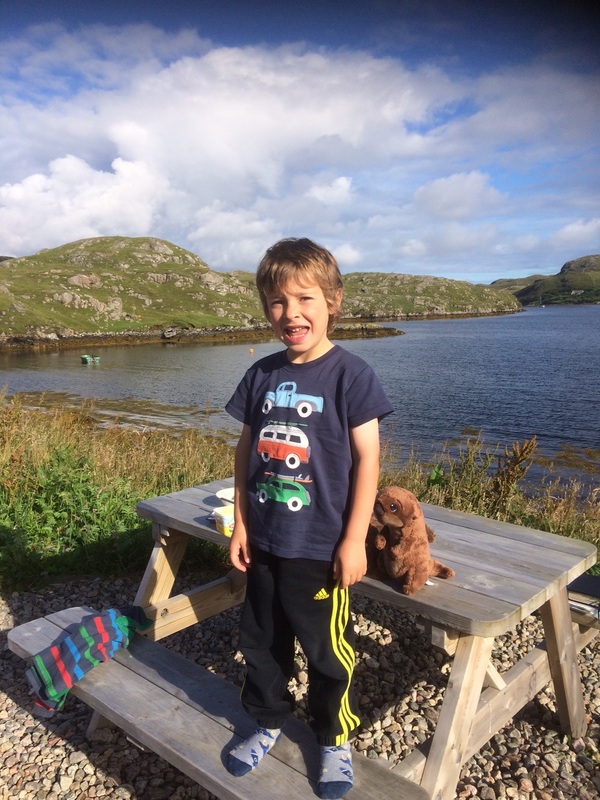 I had visited the hospital when we were on holiday last year on the Isle of Skye. Dad called the hospital to ask for their advice. 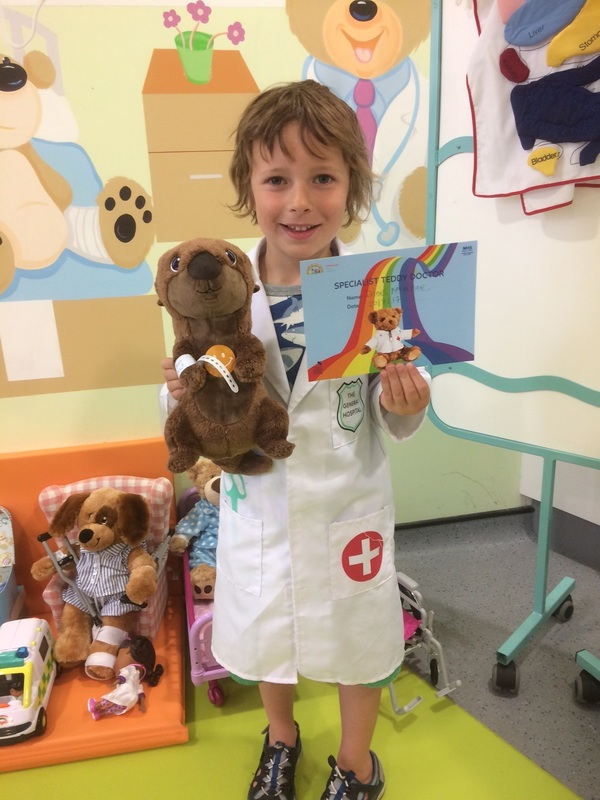 They asked if we could bring the otter to the hospital so that he could be cared for. Dad and I wrapped the otter in a cosy blanket. 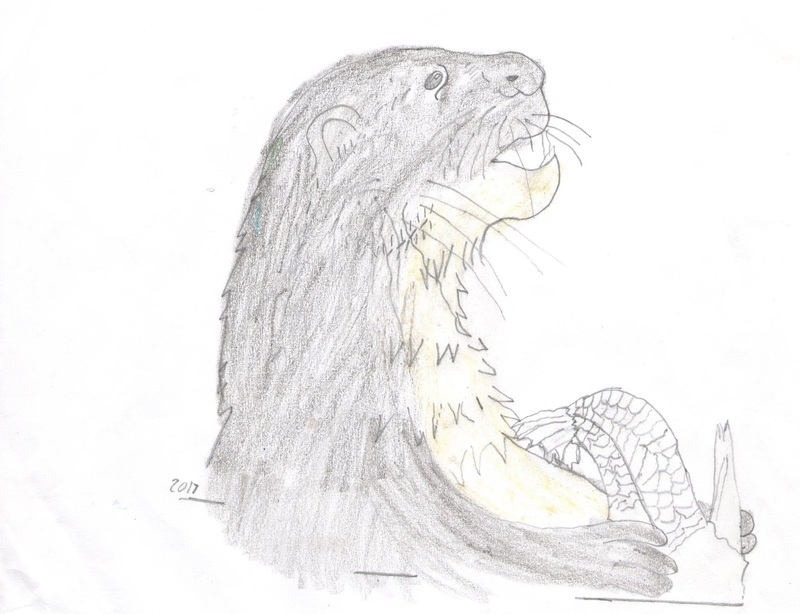 The otter was trembling but he was so exhausted that he let us carefully lift him into the back of the pick-up. We set off back along the bumpy trail. This time much more slowly so as not to frighten the otter. We came round a sharp corner and dad had to swerve suddenly to avoid a tree trunk which was lying across the track. The pick-up lurched into a ditch at the side of the dirt track. Dad revved the engine to try and get us out but it was no good. We were stuck! 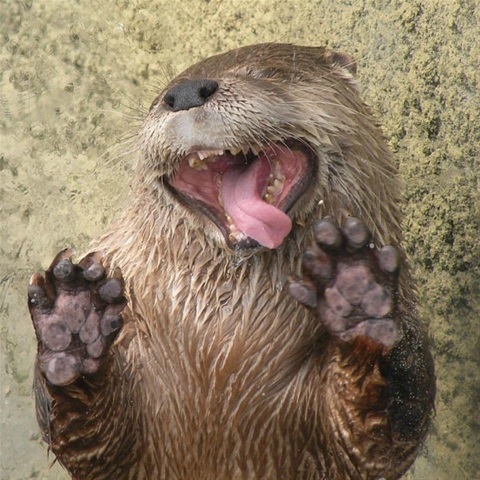 The otter was getting more and more distressed and making squeaking noises in the back of the truck. Dad and I looked at each other in panic. Now what were we going to do? 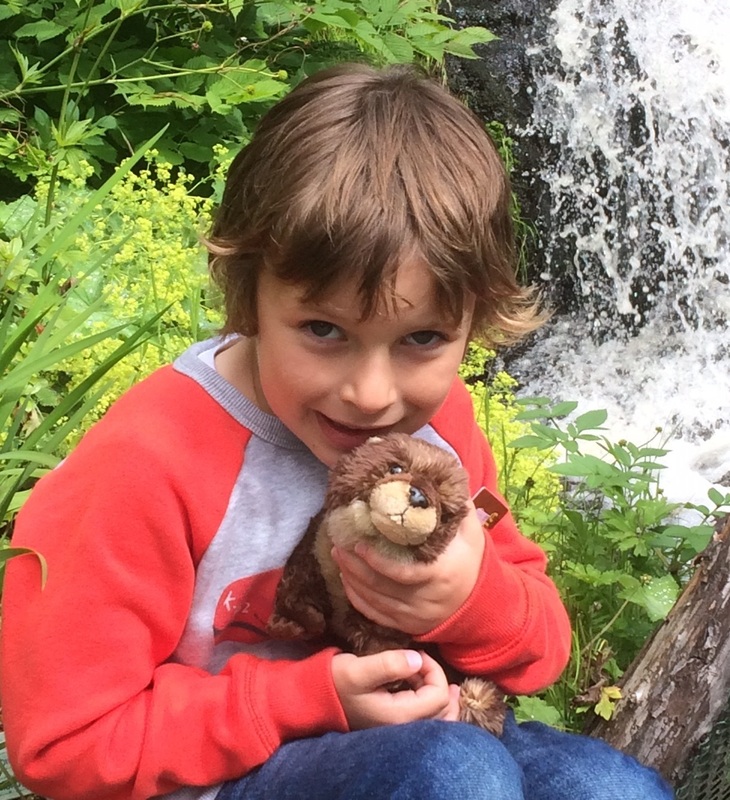 We needed to get to the hospital as soon as possible before the otter became too frightened. Dad phoned the local garage and a man with a six wheeled drive pick-up said that he would come and help us to get out of the ditch. 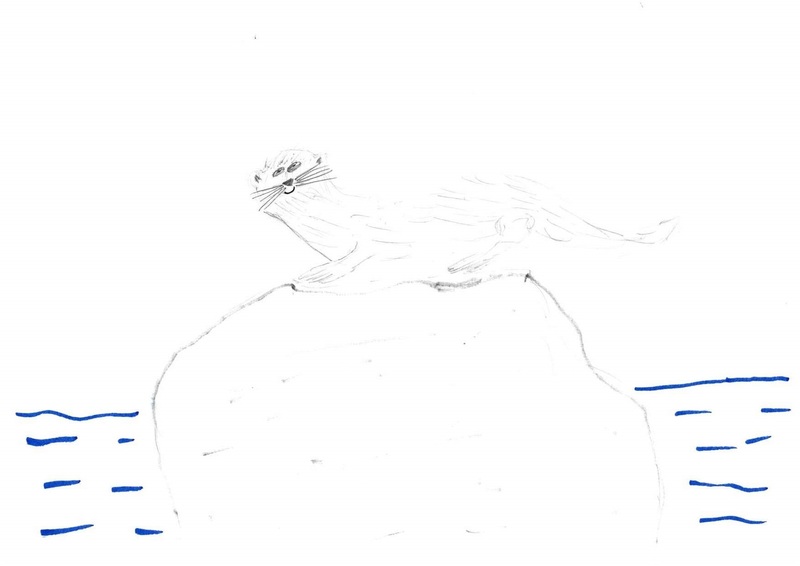 I spoke softly to the otter while we waited. It seemed like a long time but eventually he arrived and towed us out. We carried on and arrived in Broadford. A kind lady called Sarah came out to meet us. 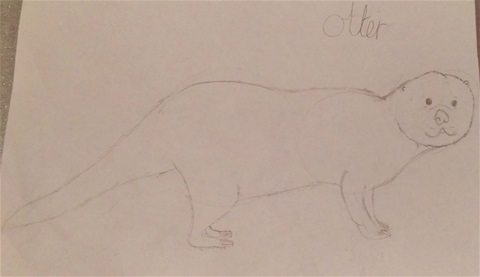 She lifted the otter gently and took him inside to be examined. Dad and I went back to the holiday cottage where we were staying to tell mum all about our adventure. 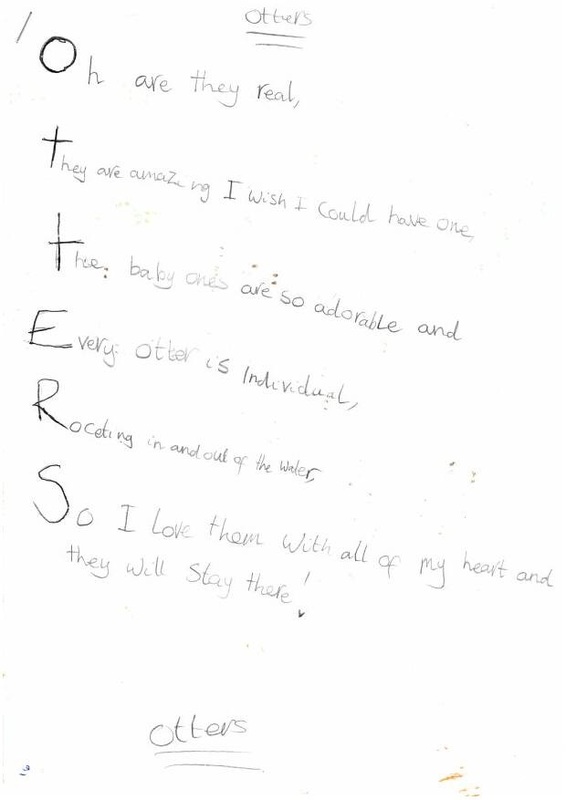 A few weeks later I received a letter to say thank you for helping to rescue 'Oscar' and a photograph showing his mended paw. I can't wait to go on the bumpy trail again and wonder what we might find next time?! 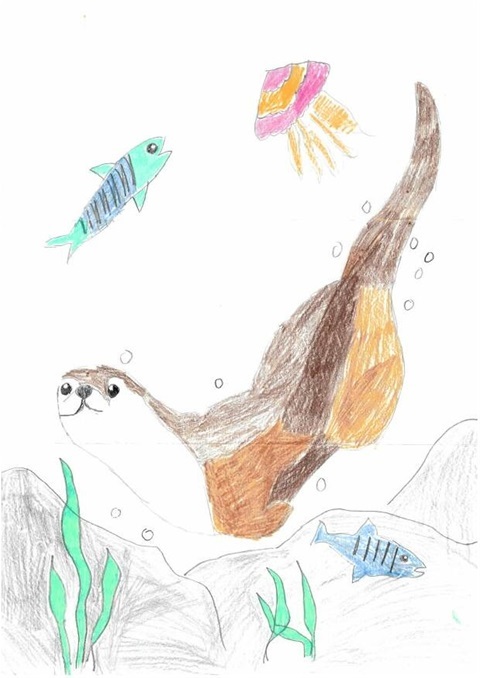 Everyone at IOSF, and all the otters, would like to congratulate Daniel for finishing runner up in the Wicked Young Writer awards. 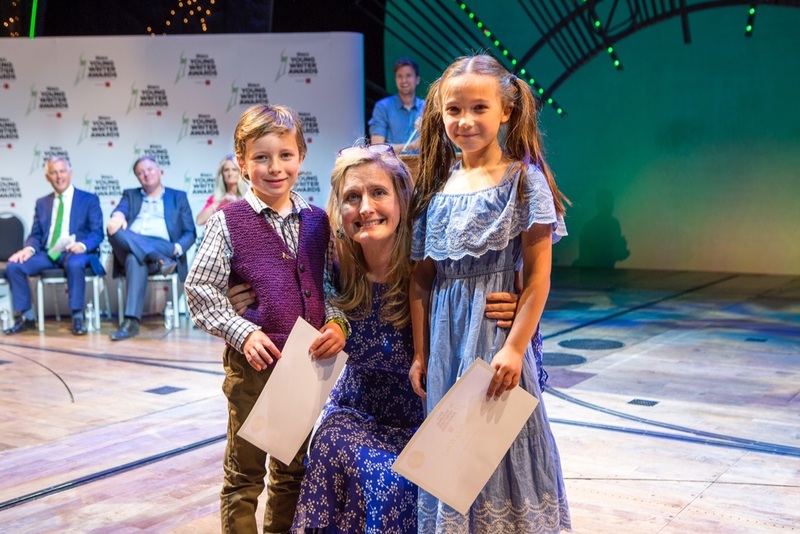 Here he is, pictured with Cressida Cowell, in London, being presented with his award. 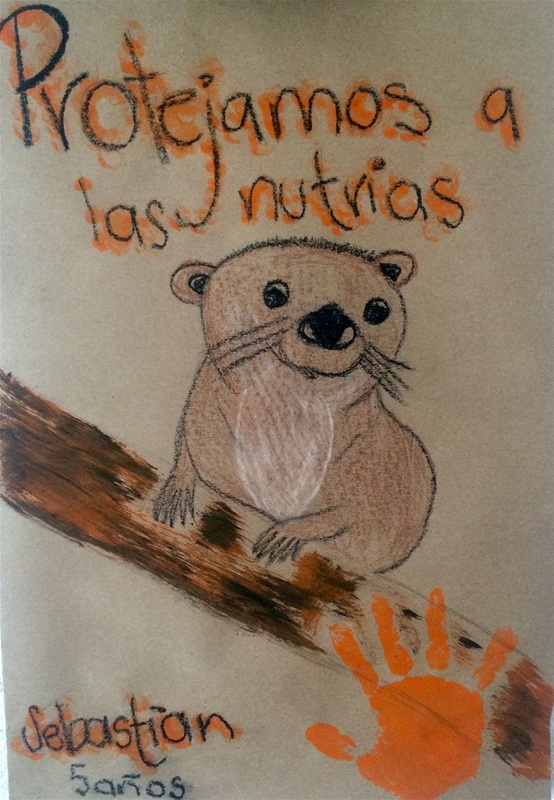 As part of World Otter Day Aurora Zoo, Guatemala, held a 2 day event to celebrate the species. 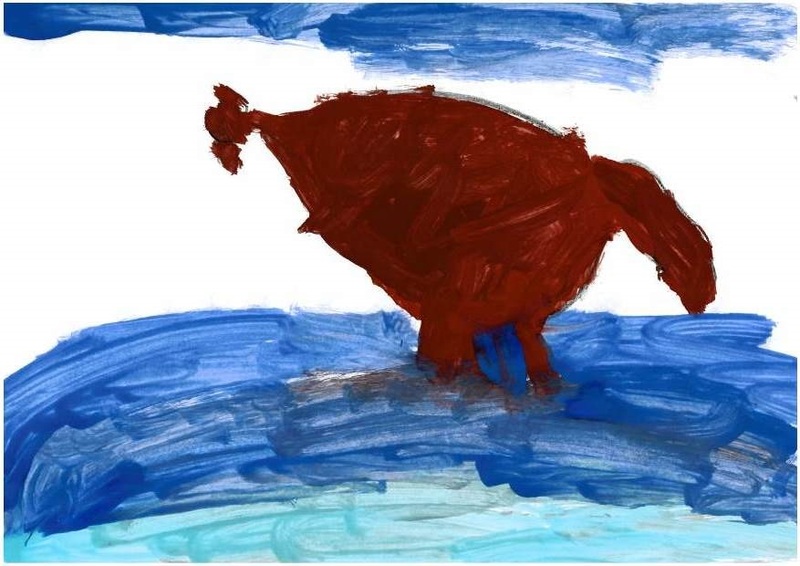 As part of the event they ran an artwork competition and this was the winner by Diego André Flores Ovando, aged 8. 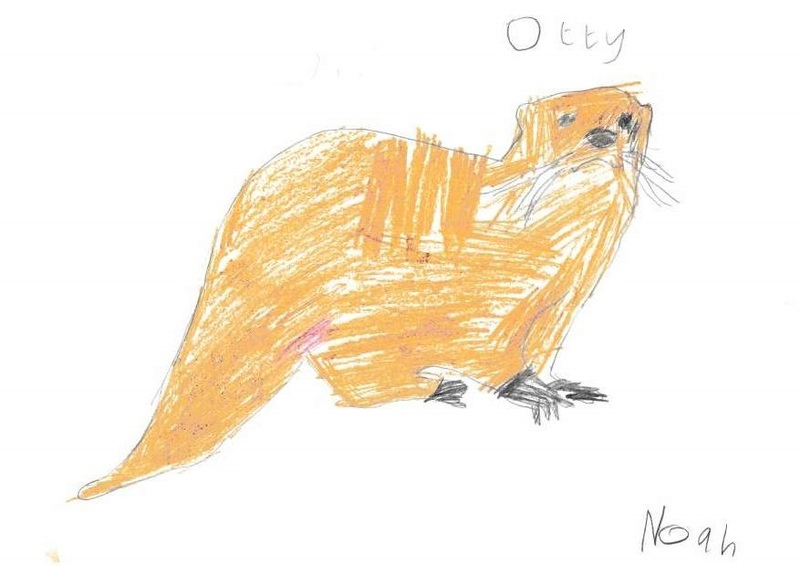 What a superb piece of ottery art! 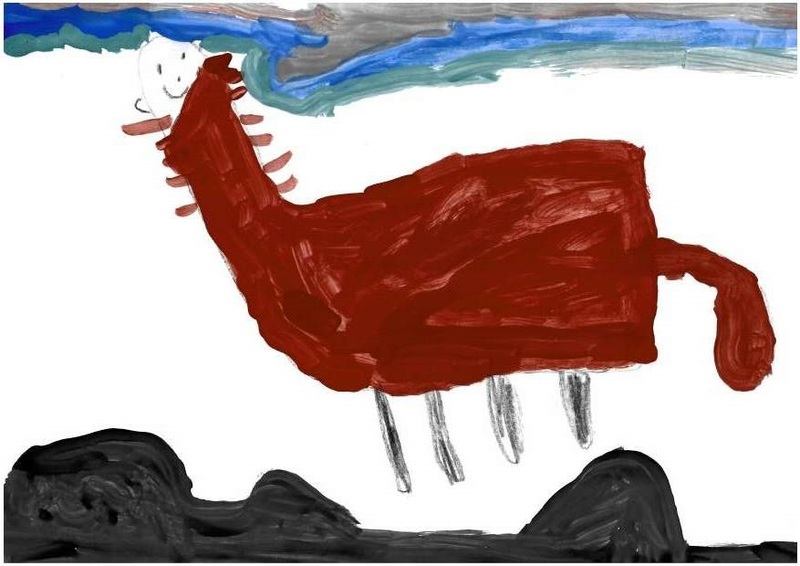 This great picture was actually handed to us personally by Cara. 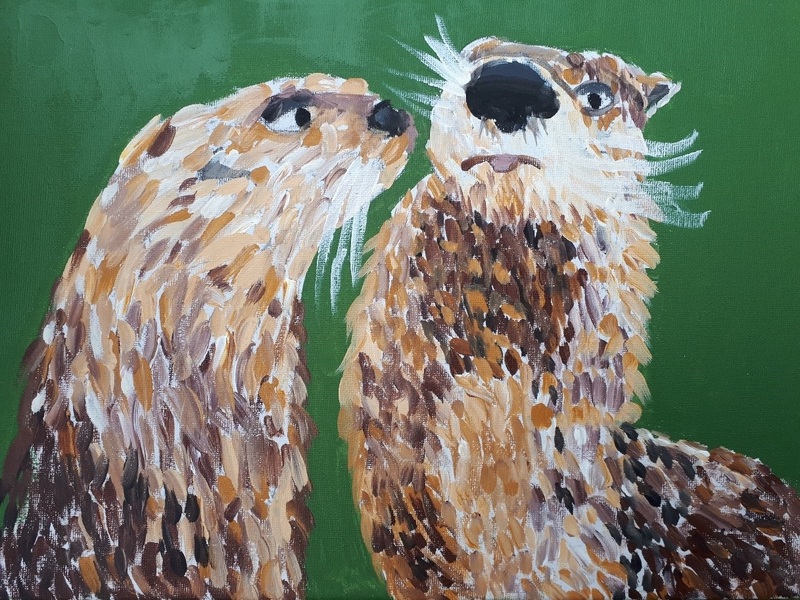 Cara has adopted an otter and has plans to sell some cakes to raise awareness for IOSF and the work it is doing. Thanks Cara, keep up the good work! 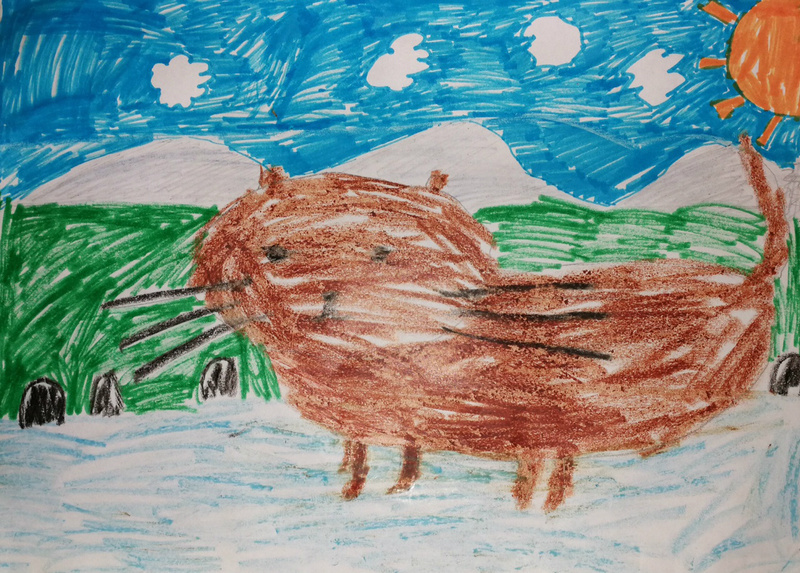 This drawing was sent in by Ryan Mackinnon, from Broadford, Isle of Skye. 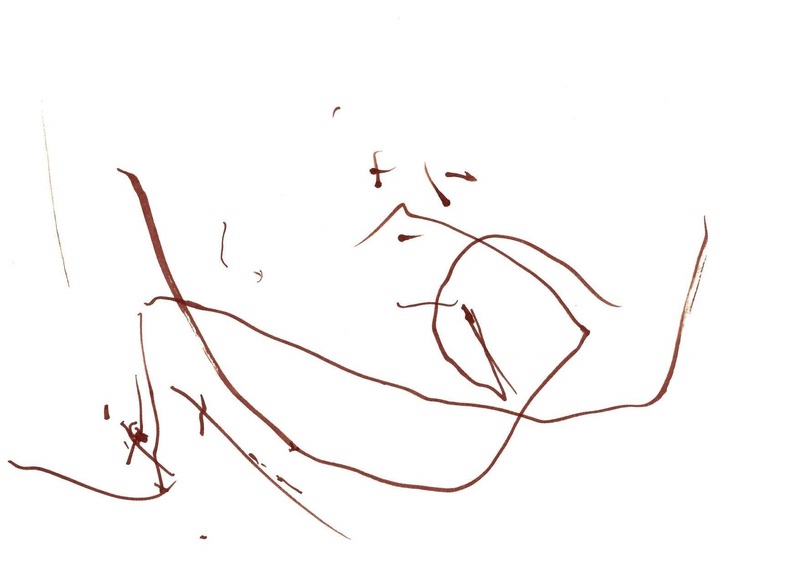 Another one of our favourite drawings was a mother and son effort. Sebastian and his mother, from Guatemala, produced this drawing of an otter with the heading "Protejamos a las nutrias" which translates to "Protect the otters"
No matter what language, I think we all agree with Sebastian's message. 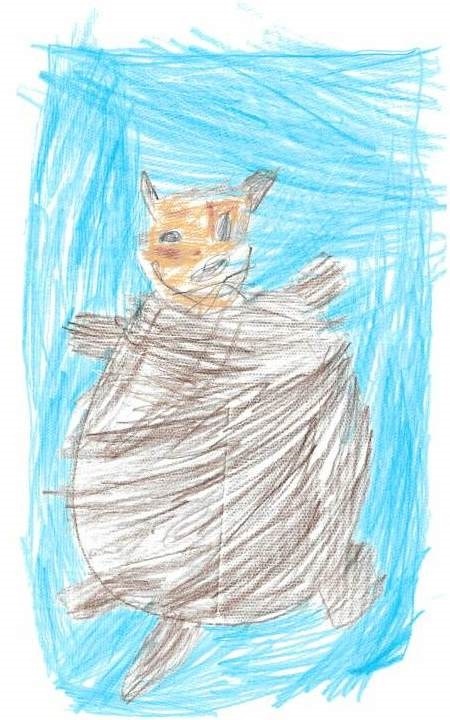 And here is Sebastian himself with his orange "paw"
This beautiful picture was drawn by Megan Bradford, aged 11, from Edinburgh. 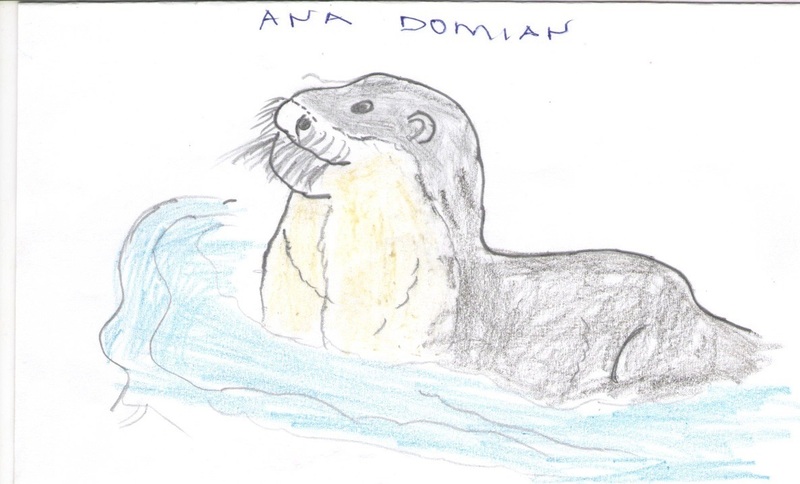 Thanks for sending us the picture Megan, keep drawing and sending us your great artwork! 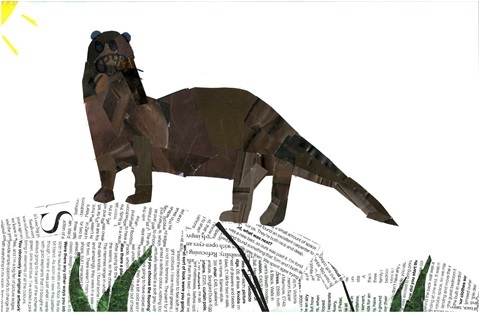 What do you call a mustelid that blows it's nose? Thanks to the Lapsley family for the joke! 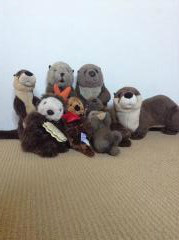 Thanks to the Aurora Zoo we were able to offer a special prize for entrants from Guatemala. We had 8 entrants and the winner was Javier Alejandro Cifuentes, aged 11. 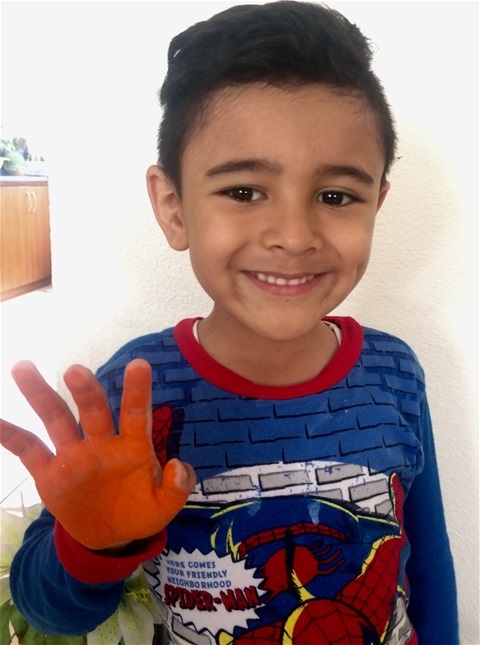 We hope you enjoy your free trip to the zoo Javier! 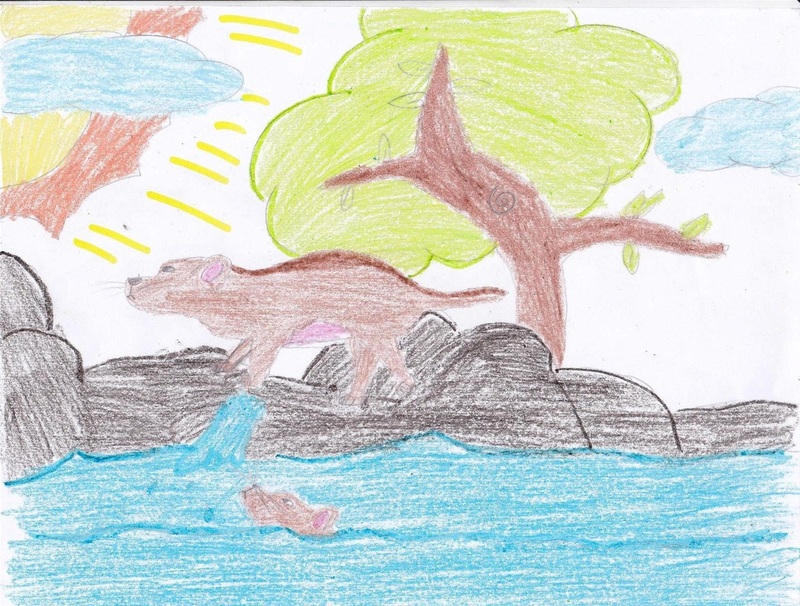 Thanks for all the kids from Guatemala for their entries. Keep an eye on this website to see if your picture makes it onto the page! 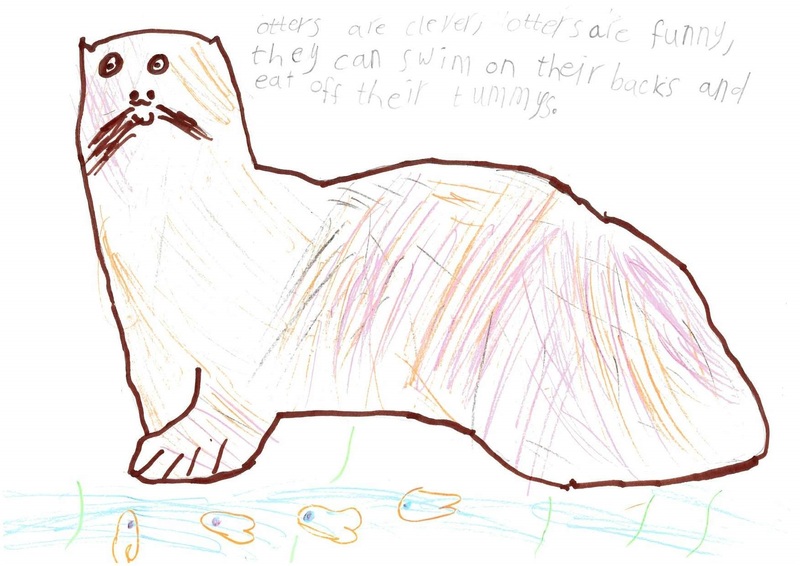 And the winner of IOSF's artwork competition, beating entries from all over the world, is Grace Maclean, aged 10, from Scotland with her beautiful drawing of a swimming otter! 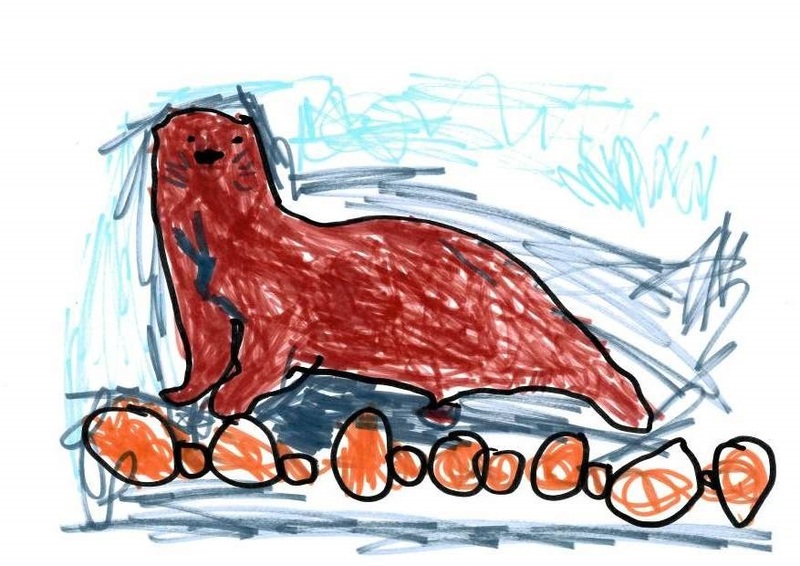 Grace has won an Otter shrinkles kit. 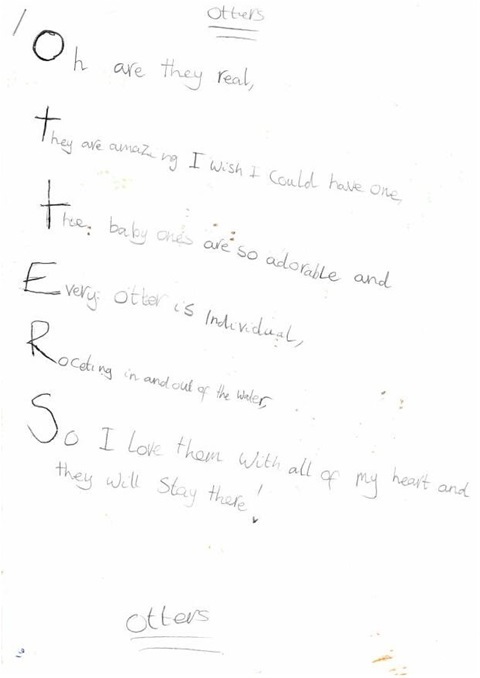 Congratulations to Grace and a massive thank you for all your amazing entries! 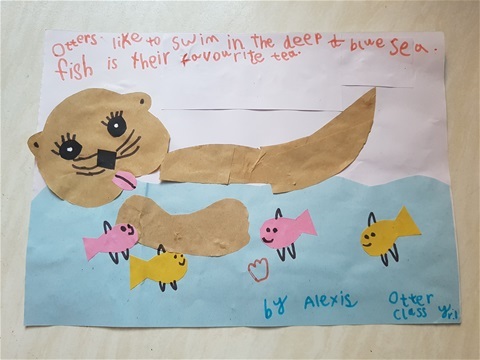 In second place and the winner of the soft cuddly otter is Alexis Keri-Nagy, aged 5, from England. 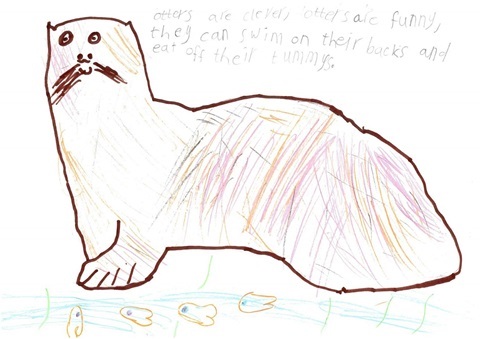 And eat off their tummys!" 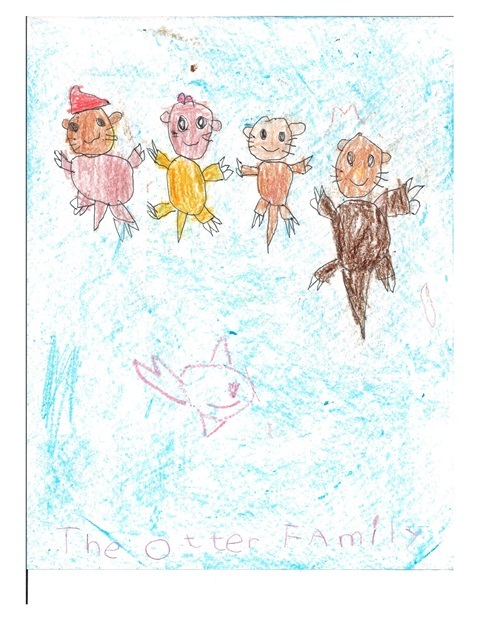 And Sidath, aged 6, from Canada for his "Otter family"
"My toy otter and I went on quite an adventure this summer, travelling all over Scotland. Check out the photos of us on our travels!" 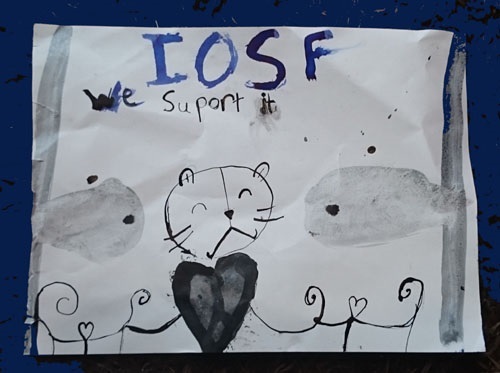 Daniel even entered IOSF's childrens artwork competition! 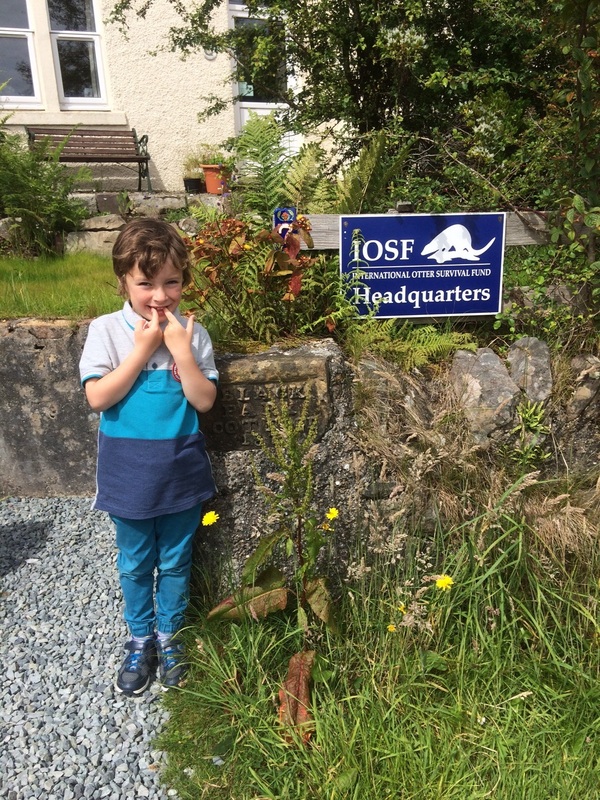 ..at Dunvegan castle, Isle of Skye..
..he even visited IOSF HQ in Broadford, Isle of Skye.. 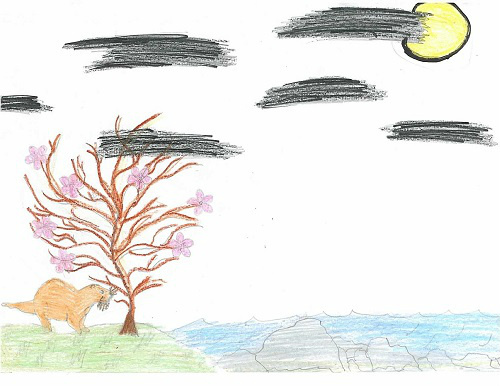 This lovely picture was done by Poppy Muir from Broadford Primary School here on the Isle of Skye. 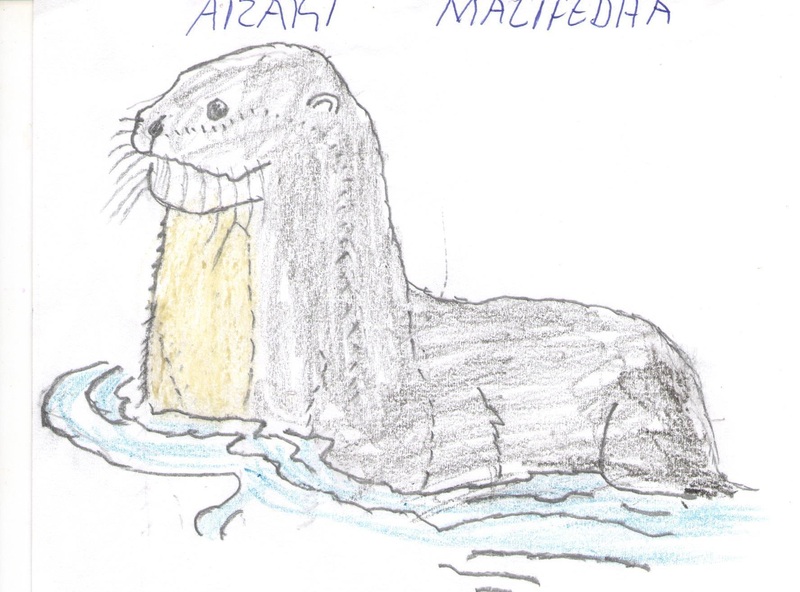 Japanese otters had all died out by the 1990s and they are now looking to bring them back. The school had a visit by one of the people who is working to bring them back to Japan as he came to Skye to see how they live in the wild. Hilary Kulas, 12, from Australia, sent us this photo of her otter family. Thanks Hilary.